Venipuncture is the act of puncturing the vein for the purpose of adding a substance or removing blood. It is usually performed in the medical setting. Substances added via venipuncture include medication, fluids, blood and diagnostic agents such as dye. The removal of blood is called phlebotomy. Blood may be removed for the purpose of analyzing it, donating it, selling it, storing it or therapeutically reducing the amount of blood in the body. There are several potential complications related to venipuncture. The University of Maryland Medical Center reports that, occasionally, a patient will bleed longer than normal after a venipuncture. This is more common in patients with certain conditions such as hemophilia. Patients taking blood thinners, aspirin and certain other drugs are also at increased risk of this complication. Some patients will develop a hematoma under the skin, which is an accumulation of blood. It may be red, purple or almost black colored and puffy to the touch. More often, a bruise will be noted. Bruises vary in color from purple to yellow and may be sore to the touch for several days. The U.S. National Library of Medicine explains that a risk of infection is present whenever the skin is broken. Cellulitis is an inflammation or infection in the tissue below the skin surface. It is a rare complication of venipuncture. Cellulitis is more likely to occur when fluids are given than during a blood draw. Phlebitis is an inflammation of a vein, which is another rare complication of the venipuncture procedure. Sepsis--a serious blood infection--is also possible following venipuncture. Sepsis is more likely to occur in patients who have a compromised immune system. This includes the elderly, patients with immune system disorders and those taking drugs to suppress the immune system. Properly cleaning the site prior to pricking the skin greatly reduces the risk of infection-related complications. 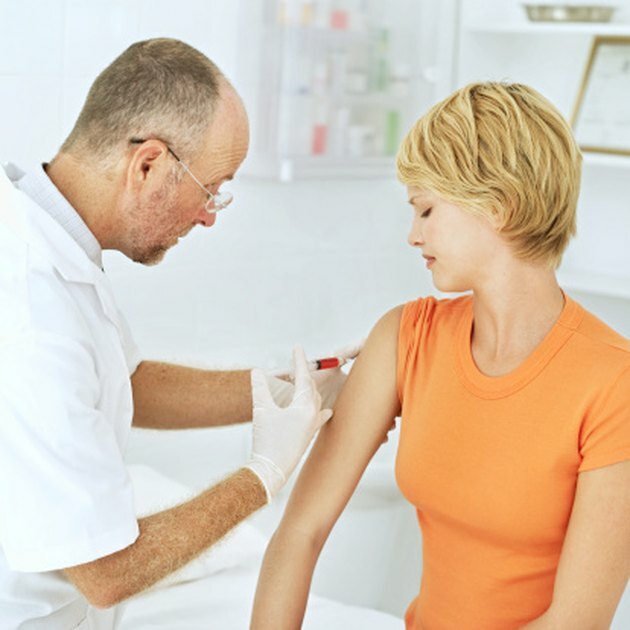 Some patients experience severe anxiety when faced with being stuck with a needle. They may hold their breath or have a strong neurological response to this fear. As a result, they may experience a vasovagal reaction such as profuse sweating, low blood pressure, near fainting and actual fainting. Occasionally, a patient who faints during or after venipuncture will have convulsions. Another risk related to fainting is the possibility of sustaining a fall injury such as head trauma or a broken bone. It is also possible to send fluids into the lungs upon passing out, causing pneumonia or other respiratory problems. A common complication of venipuncture is pain. This is usually mild, but occasionally the needle will strike a nerve, causing severe pain. Permanent nerve injury can result.